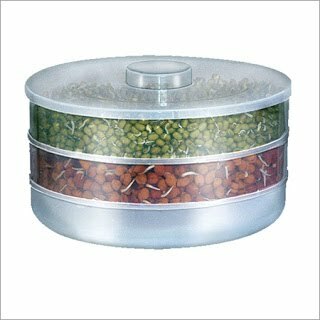 Normally sprout makers consits of 3 compartments (the medium sized ones, the larger ones have 4 compartments). * Soak the beans for about 8 hours or overnite. * Wash the beans and drain it. * Rinse the sprout maker thoroughly. * The bottom compartment is left empty. * The water from the top compartment drips into the middle one and goes down to the last one. * Remove the water from the bottom compartment every day. * Keep the sprout maker in a warm place, better on fridge top to maintain warmth. Though this is the method to be followed, many users have said, that this device is not so successful.